Botulinum neurotoxin is the most poisonous substance known. If inhaled, 1 ug would kill a person. It exerts its effect by paralyzing striated muscles or the autonomic-innervated muscles. The muscle paralyzing feature of botulinum toxin, when used beneficially, has proven to be useful in more than 50 pathological conditions, including cosmetic applications. Today, botulinum neurotoxin injection is the most commonly performed cosmetic procedure in the world. See the images below. Before BOTOX® treatment. 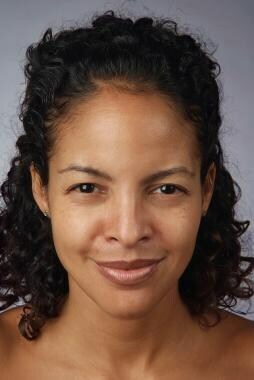 Image courtesy of Allergan, Inc.
After BOTOX® treatment. Image courtesy of Allergan, Inc.
Botulinum toxin is a polypeptide produced by the gram-positive anaerobic bacterium Clostridium botulinum. Eight serologically distinct botulinum neurotoxins exist, designated as A, B, C1, C2, D, E, F, and G. Seven are associated with paralysis. Types A, B, E and, rarely, F and G are associated with human botulism. Botulism is a bilaterally symmetric descending neuroparalytic illness caused by botulinum neurotoxin. The German physician and poet Justinus Kerner published the first full description of clinical symptoms of food-borne botulism from 1817-1822. His observations followed an increase in food poisoning in Stuttgart from 1795-1813 caused by general economic hardship related to the Napoleonic wars and a decline in hygienic measures of food production and handling. The illness became known as "sausage poisoning" because it was observed to follow ingestion of spoiled sausage. The word botulism comes from the Latin botulus, meaning sausage. Kerner deduced that the toxin acts by interrupting signal transmission within the peripheral and sympathetic nervous system, leaving sensory transmission intact. He also hypothesized possible therapeutic uses of the sausage toxin. In 1895, the microbiologist Emile-Pierre van Ermengen discovered the association with an anaerobic bacterium during an outbreak of botulism following a funeral ceremony in the Belgian village of Ellezelles. When foods tainted with neurotoxin are ingested, the neurotoxin is absorbed and spread hematogenously to peripheral cholinergic nerve terminals, where it blocks the release of acetylcholine. The neurotoxin is heat labile and denatured by cooking. Sporadic outbreaks of botulism in the United States occur after ingestion of home-canned foods, meat products, and preserved fish. The incubation period following ingestion is 18-36 hours. In contrast, infant botulism is caused by colonization of the gut by C botulinum, and subsequent production and absorption leads to absorption of the toxin. Honey consumption has been implicated in infant botulism, and microbiologic surveys have identified clostridial spores (mostly type B) in up to 25% of honey products. Wound botulism may occur if the organism infects a wound and produces the toxin. The clinical syndrome of botulism is one of progressive muscle weakness, often beginning in the extraocular or pharyngeal muscles and becoming generalized. GI tract complaints may be prominent. Dilated unreactive pupils are common, and mucous membranes are often dry and erythematous. No sensory signs are associated, and alertness is maintained as long as respiration is adequate. Botulinum toxins currently are used to treat various disorders, including strabismus, hemifacial spasms, focal dystonias (eg, blepharospasm, torticollis, spasmodic dysphonia, limb dystonia, writer's cramp), spasticity, tremor, tics, synkinesis, hyperhidrosis, achalasia, and sphincter dysfunction. They are being evaluated to treat headaches and pain syndromes. Several different proteins mediate this process. N -ethylmaleimide-sensitive fusion protein (NSF) is a cytoplasmic protein that is part of the fusion complex. Soluble N -ethylmaleimide-sensitive fusion–attachment proteins (SNAPs) are found in the cytoplasm and serve as attachment and stabilizing proteins for the NSF complex. SNAP receptors (SNAREs) are found on the vesicle and plasma membranes. SNAREs include vesicle-associated membrane protein (VAMP/synaptobrevin) and the plasma proteins SNAP-25 and syntaxin. Botulinum toxin is a zinc-dependent endopeptidase made up of a light (50 kilodaltons [kDa]) and a heavy (100 kDa) chain linked by disulfide bonds. 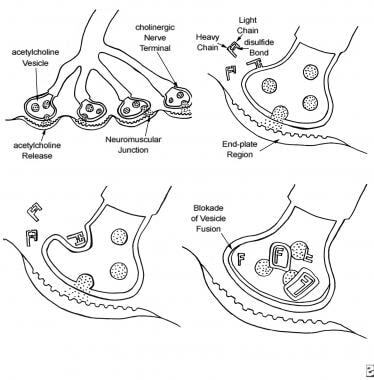 The 4-step process by which botulinum toxin reduces neuromuscular activity: (a) Normally functioning neuromuscular junction; (b) Binding step: The binding of botulinum dichain as the 100-kDa heavy chain binds to the cholinergic site on the cell membrane of the presynaptic cholinergic motor nerve terminal at a neuromuscular junction; (c) Internalization: The invagination of the cell membrane around the toxin molecule produces small endocytic vesicles within the cytoplasm of a motor nerve terminal; (d) Translocation step: Penetration and translocation of the neurotoxin 30-kDa light chain domain across the endosomal membrane of the endocytic vesicle into the cytosol of the motor nerve terminal; Blocking step: The neurotoxin 50-kDa light chain domain impedes the fusion of the acetylcholine vesicles on the inner side of the nerve terminal plasma membrane and the exocytosis of acetylcholine and its release into the synaptic cleft, preventing muscle contraction (Bendetto AV, 1999). The first step is binding of the toxin to specific receptors on the surface of the presynaptic cell surface, mediated by the C-terminal half of the heavy chain. This step occurs over approximately 30 minutes. The second step is internalization, an energy-dependent receptor-mediated endocytic process. In this step, the plasma membrane of the nerve cell invaginates around the toxin-receptor complex, forming a toxin-containing vesicle inside the nerve terminal. The third step is translocation. After internalization, the disulfide bond is cleaved, and the 50-kDa light chain of the toxin molecule is released across the endosomal membrane of the endocytic vesicle into the cytoplasm of the nerve terminal. The final step is blocking. The 50-kDa light chain of serotypes A and E inhibit acetylcholine release by cleaving a cytoplasmic protein (SNAP-25) required for the docking of acetylcholine vesicles on the inner side of the nerve terminal plasma membrane. Botulinum toxin type D is specific for VAMP/synaptobrevin. Botulinum toxin types B and F also affect the VAMP/synaptobrevin protein. These actions impede the release of acetylcholine into the synaptic cleft. The clinical effect of botulinum toxin injections lasts 2-6 months and then resolves. Once chemical denervation begins, axon terminals form new unmyelinated sprouts, and the motor endplate regions expand. See the image below. The development of extrajunctional acetylcholine receptors and expansion of the motor endplate occur after an injection of BOTOX®. 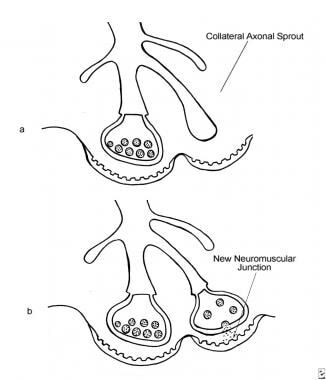 (a) An axon terminal proliferating external collateral sprouts. (b) A single nerve sprout reestablishing a new neuromuscular junction results in the return of muscle activity (Bendetto AV, 1999). After several months, the inactivated terminals slowly recover function, and the new sprouts and end plates regress. Recovery of inactivated terminals appears to be the basis of the loss of clinical effect several months after injection. Preparations of botulinum toxins include onabotulinumtoxinA (BOTOX®; BOTOX® Cosmetic), abobotulinumtoxinA (Dysport®), and incobotulinumtoxinA (Xeomin®). According to the US Food and Drug Administration’s (FDA’s) labeling, one botulinum toxin product’s units of biologic activity cannot be compared with or converted into those of another botulinum toxin product evaluated with any other specific assay method. BOTOX® is a sterile lyophilized form of botulinum toxin type A. It is produced from a culture of the Hall strain of C botulinum and purified by a series of acid precipitations to a crystalline complex containing the toxin and other proteins. The FDA approved BOTOX® in December 1989 as an orphan drug for the treatment of strabismus, hemifacial spasms, and blepharospasm. BOTOX® is distributed in 100-unit vials. The original batch of neurotoxin prepared by Shantz in November 1979 (designated batch 79-11) constituted the original BOTOX® formulation and was used until December 1997. It was replaced by a new neurotoxin complex batch designated BCB 2024. The new bulk batch is 5-6 times more potent on a weight basis. In a 100-unit vial, only 4.8 ng of neurotoxin is needed compared to 25 ng of 79-11. The new BOTOX® is comparable in clinical efficacy and safety to the old, and a unit dose of new BOTOX® provides an equivalent response to the same unit dose of old BOTOX®. The reduced protein load of the new BOTOX® has been hypothesized to lead to reduced immunogenicity and a lower incidence of neutralizing antibody formation. Dysport® is another formulation of botulinum toxin type A. It is prepared using column-based purification techniques and is distributed in 500-unit vials that can be stored at room temperature. Although BOTOX® and Dysport® are both botulinum toxin type A preparations, they are quite distinct from one another. BOTOX® is approximately 4 times more potent on a per unit basis, and Dysport® doses often are approximately 4 times the BOTOX® doses used to generate a similar clinical effect. Differences in these toxins may relate to differences in the strain of bacterium, preparation, diffusion, and potency testing. Bubbling or agitation easily denatures BOTOX®; the diluent should be gently injected onto the vial's inside wall. If the diluent is not pulled in by a vacuum, the vial should be discarded. The final dilution of BOTOX® primarily hinges on personal preference; frequently, 100 units are reconstituted in 1-10 mL of diluent. In theory, a more concentrated solution is less reliable with regard to specific unit dose delivery, while the toxin is subject to greater diffusion when the solution is more dilute. The authors prefer to use 2 mL of diluent to prepare a solution of 5 U/0.1 mL (50 U in a 1-mL tuberculin syringe if that much is to be used). Use a 30-gauge 1-inch needle to perform the injections. Reconstituted BOTOX® and BOTOX® Cosmetic should be clear and colorless, with no particulate matter present. Refrigerate reconstituted BOTOX® and BOTOX® Cosmetic at 2-8°C. The package insert indicates that reconstituted vials should be used within 24 hours. One study reported that while no activity loss occurred at 6 hours, there was a 44% potency reduction by 12 hours and, with refreezing, a 70% loss at 1-2 weeks. Other authors, however, found that a 10 U/1 mL reconstituted solution kept refrigerated for 1 month suffered no substantial potency loss. Unused reconstituted BOTOX® is usually discarded by practitioners after 1-7 days. Aging is associated with the development of lines and wrinkles caused by actinic damage, gravitational effect, sleep lines, and muscular action. Mimetic facial musculature may undergo hypertrophy secondary to hyperfunctional pull. BOTOX® injections reduce facial lines caused by hyperfunctional muscles. They also are used to contour aspects of the face such as the brows. Pretreatment photography is highly recommended to document any preexisting asymmetry. Patients should be informed that cosmetic injection in any site other than the glabella constitutes an off-label indication in the United States. An informed consent form is required, with detailed mention of possible complications, such as headache, bruising, infection, eyelid drooping, facial asymmetry, speech changes, and dysphagia. Injection techniques often vary among practitioners and over time. Patients usually notice a clinical effect 1-3 days following injection, and the effect is maximal by 1-2 weeks. Some diffusion of toxin occurs. A 10-unit injection into the frontalis muscle produces a circular area of paresis with a radius of approximately 1.5 cm. Space injections apart appropriately, and do not place injections too close to muscles in which weakness is to be avoided. Adverse effects of injection include minimal ecchymosis and bruising. Applying ice to the injection sites before and after treatment may decrease the pain and the risk of swelling and bruising. When not contraindicated, patients should avoid platelet inhibitors, including aspirin and nonsteroidal anti-inflammatory drugs, for 1 week prior to injection. Set realistic expectations. The benefits usually last 3-6 months and then resolve. A clear plan should be devised to address the individual's anatomy and areas to be injected. Performing botulinum toxin injections to treat horizontal forehead lines is relatively easy, and the result usually is quite satisfying. Treatment can include injections for glabellar frown lines when appropriate. The frontalis muscle elevates the eyebrows and the skin of the forehead. The fibers of the frontalis are oriented vertically, and wrinkles of the forehead are oriented horizontally. The frontalis muscle originates on the galea aponeurotica near the coronal suture and inserts on the superciliary ridge of the frontal bone and skin of the brow, interdigitating with fibers of the brow depressors (ie, procerus, corrugator supercilii, orbicularis oculi muscle). See the image below. 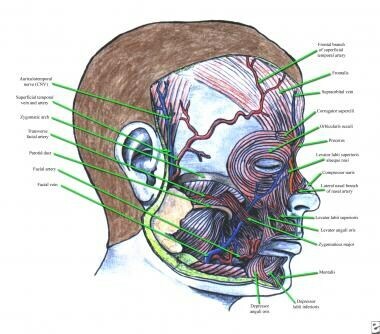 Anatomy of frontalis, corrugator supercilii, procerus muscles, and other facial muscles. The medial fibers usually are more fibrous than the lateral fibers, thus requiring less toxin for paralysis. Avoid total paralysis of the frontalis, since this is likely to cause brow ptosis and loss of expression. Injection too close to the lateral eyebrow can cause lateral eyebrow ptosis. Multiple injections of small amounts of toxin create weakness without total paralysis. Inject 3-5 sites on each side of the midline, usually using 2 units (1-3 U) of BOTOX® Cosmetic per site. Separate sites by 1-2 cm. Choose an initial injection site approximately 1 cm above the eyebrow vertical to the medial canthus. Additional sites diverge laterally and upward to the hairline in a "V" configuration, often for a total of 3 sites. Additional sites (1-3) can be added in the midline or more laterally (1-2) depending on individual and clinical response. If wrinkles extend to the temporal region, lateral injections can be performed. Use caution to prevent injecting lateral to the lateral canthus to avoid inhibiting temporalis function. Use caution when injecting patients in whom the hyperfunctional frontal lines support a ptotic upper eyelid. Injections of the upper face and periocular region usually are performed with the patient seated, and the patient is asked to remain upright for 2-3 hours to prevent spread of toxin through the orbital septum. Glabellar frown lines are the most common reason for cosmetic botulinum toxin injection. See the image below. (1) Botulinum toxin dose used to treat glabellar frown lines in an individual with an arched brow. The arch represents the bony rim, not the eyebrow. (2) Botulinum toxin dose used to treat glabellar frown lines in a woman with a more horizontal-type brow. Facial rhytides and folds in this area result from action of the depressor muscles (ie, corrugator supercilii, depressor supercilii, orbicularis oculi, procerus). See the image below. The corrugator superciliaris, medial orbital portion of the orbicularis oculi, and more vertically oriented fibers of the depressor supercilii produce the vertical lines of the glabella. The corrugator muscle is a brow adductor moving the eyebrow downward and medially. It arises from the nasal bone just above the rim of the orbit medially and extends laterally and upward, inserting in the skin above the middle of the eyebrow. It lies deep to the frontalis, procerus, and orbicularis oculi muscles. The medial fibers of the orbicularis oculi originate from the medial orbital rim anterior to the origin of the corrugator. The fibers interdigitate with fibers of the frontalis, procerus, and corrugator muscles. The depressor supercilii originates from the nasal process of the frontal bone and inserts into the skin at the medial aspect of the eyebrow. The vertically oriented procerus muscle, which originates from the upper nasal cartilage and the lower nasal bone, produces the horizontal lines of the glabella and nasal root. It inserts into the skin between the brows and the frontal belly of the occipitofrontalis. Its fibers interdigitate with those of the orbicularis, frontalis, and corrugator muscles. Usually, 5 sites are injected. One site on each side is used to inject the corrugator, one site on each side is used to inject the orbicularis oculi and depressor supercilii, and one site is used to inject the procerus in the midline. The patient is asked initially to frown and scowl, and the target muscles are palpated. Place the first injection into the belly of the corrugator muscle. Insert the needle at the origin of the corrugator fibers just above the medial canthus and superciliary arch until bone is felt, and then withdraw it slightly. Advance the needle within the belly of the muscle upward and lateral as far as the medial third of the eyebrow, 1 cm superior to the orbital rim. Inject the first dose as the needle is withdrawn. The next site is approximately 1 cm above the upper medial aspect of the supraorbital ridge. Advance the needle slightly in a vertical direction toward the hairline. Inject the next dose into the orbicularis oculi and depressor supercilii as the needle is withdrawn. Repeat these injections on the contralateral side. Place the last injection into the belly of the procerus to eliminate the horizontal lines at the root of the nose. Inject the last dose at a point where 2 lines drawn at 45° from the medial aspect of the eyebrows converge in the center of the nasal root, just superior to the horizontal plane of the medial canthi. To avoid resultant accentuation of eyebrow arching in men, consider injecting an additional dose 1 cm above the supraorbital prominence vertical to the midpoint of the eyebrow. A glabellar "spread test" may be performed prior to injection by spreading the glabellar wrinkles apart with the thumb and index fingers. This may allow an estimate of the expected benefit from botulinium toxin injection. Patients with thick sebaceous skin and deep dermal scarring that are not improved with manual spreading usually respond poorly to botulinum toxin injections. EMG guidance may provide valuable information when initial injections prove unsatisfactory. Aging and photodamage cause much of the wrinkling in this area. However, the component of hyperfunctional contraction of the lateral aspect of the orbicularis oculi is targeted for improvement with onabotulinumtoxinA injections. The lateral fibers of the orbicularis oculi are arranged in a circular pattern around the eye. Contraction of these fibers produces wrinkles that extend radially from the region of the lateral canthus. Perform 3 or 4 subcutaneous injections approximately 1 cm lateral to the lateral orbital rim using 2-3 units of onabotulinumtoxinA per injection site (for a total of 6-12 U per side). Space sites 0.5-1 cm apart in a vertical line or slightly curving arch. Doses that are too high or injections that are too medial can lead to eyelid ptosis or diplopia. With age, the lateral eyebrow typically becomes ptotic before the medial aspect. The lateral brow is more affected by the gravitational descent of the temporal soft tissue mass and the downward force of the corrugator supercilii and orbicularis oculi muscles. Temporal brow lift can be achieved by onabotulinumtoxinA injections into the lateral brow depressors. Ahn et al treated patients seeking elevation in eyebrow height with 7-10 units of onabotulinumtoxinA injected into the superolateral portion of the orbicularis oculi below the lateral third of the brow. Mean brow height increased 1.0 mm at the midpupil and 4.8 mm at the lateral canthus (P = 0.038 and 0.0001, respectively). Injecting superior and lateral to the orbital rim minimized the potential for ptosis. 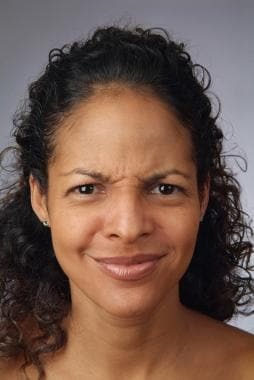 Contraction of this muscle is observed when an individual "scrunches" his or her nose, and hyperfunctional contraction often confers a "mad dog" appearance to the face. This muscle can be injected with 2-5 units of onabotulinumtoxinA on each side of the nose lateral to the nasion. Several patients with undesirable nasal flare have been treated successfully with serial onabotulinumtoxinA injections. Reduction of a prominent mental crease can be achieved by injection of 5-10 units of onabotulinumtoxinA into the point of the chin. Injections of onabotulinumtoxinA can improve facial asymmetry and synkinesis. The asymmetry of residual unilateral paresis can be reduced by judicious injection of normal muscles on the unaffected side. Hyperkinesis from aberrant degeneration can be reduced by injection of hyperkinetic muscles. Optimally treat multiple fine wrinkles using a filler substance such as injectable collagen or by middepth or deeper resurfacing. These fine wrinkles do not respond well to onabotulinumtoxinA injections, and the upper lip is sensitive to paresis. However, botulinum toxin injections may be used in individuals with 2 or 3 deep wrinkles. Small doses of botulinum toxin (0.5-1 U per wrinkle) may be administered, injected superficially rather than deeply. Avoiding weakness of the upper lip is important. To weaken the depressor anguli oris, which is the underlying muscle of the downturn at the corner of the mouth, 2-3 units of botulinum toxin may be injected. Instruct the individual to forcibly pull down the corners of the mouth; the depressor anguli oris can be felt inferior to a point 1 cm lateral to the commissure. Carruthers and Carruthers, attempting to soften the nasolabial fold, injected low doses (2-3 U) of onabotulinumtoxinA in the levator labii superioris alaeque nasi. EMG localization of the muscle was used. Some of the individuals who had softening of the folds showed lengthening of the upper lip. In general, achieving a good result in attempting to soften the nasolabial fold is difficult. Botulinum toxin injections may be used to provide presurgical chemodenervation of the brow depressor muscles, giving better results with surgical repositioning of the brow. Pretreatment of crow's feet allows the surgeon to better define the incision line within the confines of the bony orbital margin. The platysma muscle originates inferiorly from the pectoralis and deltoid fascia. It crosses the sternocleidomastoid at the midlateral neck area at the Erb point. In 75% of individuals, the platysmal fibers interface with those on the opposite side 1-2 cm below the chin. In 15% of individuals, the fibers interdigitate at the level of the thyroid cartilage and cover the submental area confluently, forming one band. In 10% of individuals, the fibers do not decussate with those on the opposite side. See the image below. (A) The platysma muscle is joined together at the anterosuperior neck two thirds of the time. This crisscross or decussation usually covers approximately one half the distance from the chin to the hyoid bone. (B) One third of the time, the decussations are absent, or a complete separation occurs. The lateral bands of the platysma muscle facilitate facial expression by lowering the corners of the lower lip. 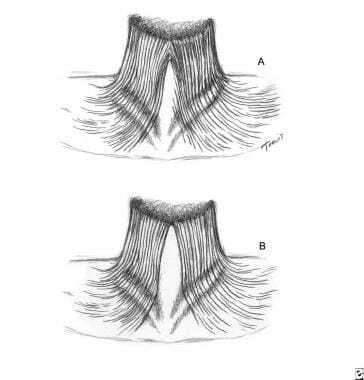 Its posterior fibers continue superiorly to join the superficial musculoaponeurotic system (SMAS) of the face. At the anterior chin, the deeper lower lip depressors are shaped like a large, split "M" formed by the depressor anguli inferioris, the mentalis, and the depressor anguli inferioris on the other side. A wider split M, representing the lateral commissure muscle and the depressor anguli oris, covers this split M. See the image below. The anatomy of the muscles of the lower lip can be represented as 2 split Ms covering each other. These 2 Ms act in concert to open, contract, depress, and animate the lower lip. The deeper M is the central mentalis muscle that contracts the chin and helps raise it. This muscle responds well to botulinum A toxin injections. The lateral limb is the depressor labii inferioris (DLI). This lowers the lower lip. The more superficial and more widely split M represents the platysma muscle, which inserts into the lateral chin and commissure of the mouth. The depressor anguli oris (DAO) pulls down the corner of the mouth. 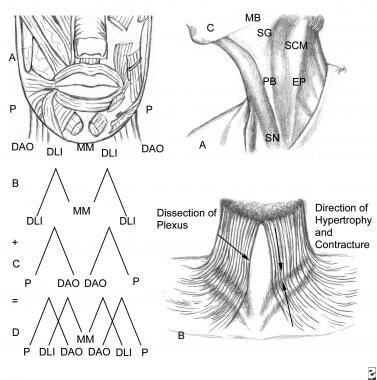 EP - Topographic point to inject local anesthetic; PB - Platysma band injected in patients with hypertrophied or sagging muscle; SG - Submandibular gland; SN - Sternal notch; SCM - Sternocleidomastoid muscle; MB - Mandibular border. Several factors affect aging of the neck, including heredity, actinic damage, and weight changes. Age-related downward pull of the platysma muscle creates vertical fibrous bands. The skin laxity over the platysma muscle produces horizontal rhytides. The inferior pull of the platysma-SMAS complex, together with the age-related skin and muscular degeneration, causes the largest submental fat pad to herniate between the 2 free borders of the platysma muscle. After preparing the skin, ask the patient to contract the platysma muscle; this identifies its bands. Injection techniques vary among practitioners. Some use a few injections along the length of a band while others use many. Some practitioners use EMG guidance, although this usually is not necessary. One technique involves injecting each band at 1.0- to 1.5-cm intervals from the jawline to the lower neck. Approximately 3-10 units of onabotulinumtoxinA may be injected, depending on the thickness of the platysmal band. Another technique involves injecting the bands at the following 3 sites: the curve between the horizontal submental surface and the vertical anterior surface, at points that are midway between this point and the anterior extent of the band on the submental surface, and the inferior extent of the band on the anterior neck. The 2 large bands can be injected with 20 units each of onabotulinumtoxinA, and smaller bands with 5 units each. Most patients require a total of 50-100 units of onabotulinumtoxinA, and some require as many as 200 units. Use caution to inject the platysma muscles and not the muscles beneath them, since this is more likely to cause swallowing weakness. Complications are minimal and may include transient edema and ecchymoses, hematoma formation, muscle soreness, and mild neck weakness. Contraindications include prior allergic reaction, injection into areas of infection or inflammation, pregnancy, or breastfeeding. Women who inadvertently were injected during pregnancy thus far have had uneventful deliveries, and to date no teratogenicity has been attributed to botulinum toxin. Nonetheless, it is a category C medication, and delay of injections is recommended until pregnancy is complete and breastfeeding has ended. Treat patients with diseases of the neuromuscular junction (eg, myasthenia gravis) cautiously because underlying generalized weakness can be exacerbated, and local weakness at injection sites can occur more than otherwise expected. Some medications decrease neuromuscular transmission and generally should be avoided in patients treated with botulinum toxin. These include aminoglycosides, penicillamine, quinine, and calcium channel blockers. Single-fiber EMG studies have detected neuromuscular changes far removed from injection sites. This likely reflects hematogenous spread of a small amount of toxin and is not of known clinical significance. Avoid intravascular injections because diffuse spread of large amounts of toxin can mimic the symptoms of botulism. Generalized idiosyncratic reactions are uncommon, generally mild, and generally transient. These include nausea, fatigue, malaise, flulike symptoms, and rashes at sites distant from the injections. Untoward sequelae caused by percutaneous injection include pain, edema, erythema, ecchymosis, headache, and hypesthesia. These also are generally mild and transient. The most common meaningful adverse effect is unwanted weakness. Fortunately, unwanted weakness caused by the action of the toxin usually resolves in several months and in some patients in a few weeks, depending on the site, strength of the injections, and the muscles made excessively weak. Carefully counsel patients who depend on emotive expression, such as actors and politicians, about a potential reduction in facial expression. Excess weakness following frontalis injection may cause paralysis rather than weakening of the muscle. Patients report they appear masklike and their brow feels heavy. If brow ptosis occurs, a hooded appearance may be present, and occasionally vision may be partially obstructed. Therefore, avoiding use of overly large doses and restricting injections to 1 cm above the eyebrow are important. If the lateral fibers of the frontalis have not been injected appropriately, a quizzical appearance may result in which the lateral brow is pulled up while the central brow is lowered. Inject a small amount of toxin into the lateral fibers to treat this. Note the clear distinction between hyperfunctional brow lines with no underlying brow ptosis versus frontalis contraction to elevate ptotic brows. If botulinum toxin is used in the latter case, brow ptosis is likely. The brow depressors generally can be paralyzed to treat glabellar lines. However, ptosis of the upper eyelid is a common complication following injection in this region. This may occur as late as 2 weeks after injection. Ptosis is caused by migration of toxin through the orbital septum. Patients often are instructed to remain in an upright position for 3-4 hours following injection and to avoid manual manipulation of the area. Active contraction of the muscles under treatment may increase the uptake of toxin and decrease its diffusion. To avoid ptosis, place injections 1 cm above the eyebrow and do not cross the midpupillary line. Ptosis can be treated with apraclonidine 0.5% eyedrops. This is an alpha2-adrenergic agonist, which causes Müller muscles to contract. Apraclonidine is contraindicated in patients with documented hypersensitivity. Phenylephrine (Neo-Synephrine) 2.5% can be used when apraclonidine is not available. Neo-Synephrine is contraindicated in patients with narrow-angle glaucoma and in patients with aneurysms. Use 1-2 drops 3 times daily until ptosis resolves. Weakness of the lower eyelid or lateral rectus can occur following injection of the lateral orbicularis oculi. If severe lower lid weakness occurs, an exposure keratitis may result. If the lateral rectus is weakened, diplopia results. Treatment is symptomatic. Avoid these complications by injecting at least 1 cm lateral to the lateral canthus and above the zygomatic arch. Injection of platysma muscles can result in dysphagia from diffusion of toxin into muscles of deglutition. When this occurs, it usually lasts only a few days or weeks. Some patients may require soft foods. Although swallowing weakness does not herald systemic toxicity, if it is severe, patients may be at risk of aspiration; seek consultation. Some patients experience neck weakness, which is especially noticeable when attempting to raise the head from a supine position. This occurs after weakening of the sternocleidomastoid muscles, either from direct injection or diffusion. This is more common in women with long thin necks. Avoid these adverse effects by using the lowest effective doses and precisely placing toxin into the platysma. Some patients do not respond to injections and, having never previously responded, are designated as primary nonresponders. Lack of response has many potential causes. Patients with rhytides that are not dynamic in origin (eg, photodamage, age-related changes) do not respond. Possibly, the injection technique was inadequate or the toxin denatured. Theoretically, some patients may have neutralizing antibodies from prior subclinical exposure, or individual variations in docking proteins may exist. A test dose (eg, 15 U of onabotulinumtoxinA) in the frontalis muscle should indicate whether the patient experiences a physiologic response (weakness) to toxin. Secondary nonresponders respond initially but lose the response on subsequent injections. Most of these patients may have developed neutralizing antibodies. Some patients injected for cosmetic purposes develop neutralizing antibodies. When a patient loses his or her response, serum can be tested for neutralizing antibodies, although this rarely is performed outside research settings. Alternatively, a patient's physiologic response can be evaluated with a single injection of 15 units into the frontalis on one side. Limited information is available as to whether neutralizing antibodies resolve over time and, consequently, whether attempts at reinjection should be made after a prolonged period. Using the lowest dose of toxin necessary to achieve the desired clinical effect and avoiding reinjection within 1 month appear prudent in an effort to keep antibody formation as low and unlikely as possible. To choose the most appropriate treatment for lines of the face, distinguish between rhytides created by loss of collagen or elastic fibers, loss of fat, redundant folds, and facial lines caused by hyperfunctional muscles. Botulinum toxin injected in small amounts into the face and neck muscles can improve the appearance of facial lines and platysma bands of the neck for several months. Adverse effects are usually mild and transient. The most common substantive complication is excessive or unwanted weakness, and this resolves as the action of the toxin is lost. Brow ptosis, eyelid ptosis, neck weakness, dysphagia, and diplopia may occur. Knowledge of the functional anatomy and experience with the procedure help injectors avoid complications. The clinical benefit is extremely gratifying, especially when used for hyperfunctional lines of the upper face. Koussoulakos S. Botulinum neurotoxin: the ugly duckling. Eur Neurol. 2009. 61(6):331-42. [Medline]. Schlessinger J, Gilbert E, Cohen JL, Kaufman J. New Uses of AbobotulinumtoxinA in Aesthetics. Aesthet Surg J. 2017 May 1. 37 (suppl_1):S45-S58. [Medline]. [Full Text]. Erbguth FJ, Naumann M. Historical aspects of botulinum toxin: Justinus Kerner (1786-1862) and the "sausage poison". Neurology. 1999 Nov 10. 53(8):1850-3. [Medline]. Carruthers A, Carruthers J. Cosmetic uses of botulinum A exotoxin. Adv Dermatol. 1997. 12:325-47; discussion 348. [Medline]. Carruthers A, Carruthers J. Clinical indications and injection technique for the cosmetic use of botulinum A exotoxin. Dermatol Surg. 1998 Nov. 24(11):1189-94. [Medline]. Ferrari A, Manca M, Tugnoli V, Alberto L. Pharmacological differences and clinical implications of various botulinum toxin preparations: a critical appraisal. Funct Neurol. 2018 Jan/Mar. 33 (1):7-18. [Medline]. [Full Text]. Xeomin (incobotulinumtoxinA) [package insert]. GmbH Eckenheimer Landstrasse 100 Frankfurt Germany: Merz Pharmaceuticals. Dec 2015. Available at [Full Text]. Dysport (abobotulinumtoxinA) [package insert]. Wrexham, LL13 9UF, UK U.S. License No. 1787: Ipsen Biopharm Ltd. Jun 2017. Available at [Full Text]. Botox; Botox Cosmetic(onabotulinumtoxinA ) [package insert]. Allergan, Inc. 2525 Dupont Dr. Irvine, CA 92612: Allergan Pharmaceuticals. Oct 2017. Available at [Full Text]. Schlessinger J, Dover JS, Joseph J, et al. Long-term safety of abobotulinumtoxinA for the treatment of glabellar lines: results from a 36-month, multicenter, open-label extension study. Dermatol Surg. 2014 Feb. 40(2):176-83. [Medline]. Carruthers JD, Carruthers JA. Treatment of glabellar frown lines with C. botulinum-A exotoxin. J Dermatol Surg Oncol. 1992 Jan. 18(1):17-21. [Medline]. Hsu TS, Dover JS, Arndt KA. Effect of volume and concentration on the diffusion of botulinum exotoxin A. Arch Dermatol. 2004 Nov. 140(11):1351-4. [Medline]. Dressler D, Bigalke H. Long-term stability of reconstituted incobotulinumtoxinA: how can we reduce costs of botulinum toxin therapy?. J Neural Transm (Vienna). 2017 Oct. 124 (10):1223-5. [Medline]. Beer K, Cohen JL, Carruthers A. Cosmetic uses of botulinum toxin. Ward AB, Barnes MP. Clinical Uses of Botulinum Toxin. Cambridge, Mass: Cambridge University Press; 2007. Yeilding RH, Fezza JP. A Prospective, Split-Face, Randomized, Double-Blind Study Comparing OnabotulinumtoxinA to IncobotulinumtoxinA for Upper Face Wrinkles. Plast Reconstr Surg. 2015 May. 135 (5):1328-35. [Medline]. Hankins CL, Strimling R, Rogers GS. Botulinum A toxin for glabellar wrinkles. Dose and response. Dermatol Surg. 1998 Nov. 24(11):1181-3. [Medline]. Rzany B, Ascher B, Fratila A, Monheit GD, Talarico S, Sterry W. Efficacy and safety of 3- and 5-injection patterns (30 and 50 U) of botulinum toxin A (Dysport) for the treatment of wrinkles in the glabella and the central forehead region. Arch Dermatol. 2006 Mar. 142(3):320-6. [Medline]. Charles Finn J, Cox SE, Earl ML. Social implications of hyperfunctional facial lines. Dermatol Surg. 2003 May. 29(5):450-5. [Medline]. Carruthers J, Rivkin A, Donofrio L, et al. A Multicenter, Randomized, Double-Blind, Placebo-Controlled Study to Evaluate the Efficacy and Safety of Repeated OnabotulinumtoxinA Treatments in Subjects With Crow's Feet Lines and Glabellar Lines. Dermatol Surg. 2015 Jun. 41 (6):702-11. [Medline]. Kane MA. Nonsurgical treatment of platysmal bands with injection of botulinum toxin A [published erratum appears in Plast Reconstr Surg 1999 Mar;103(3):following table of contents]. Plast Reconstr Surg. 1999 Feb. 103(2):656-63; discussion 664-5. [Medline]. Dressler D, Hallett M. Immunological aspects of Botox, Dysport and Myobloc/NeuroBloc. Eur J Neurol. 2006 Feb. 13 Suppl 1:11-5. [Medline]. Jankovic J, Vuong KD, Ahsan J. Comparison of efficacy and immunogenicity of original versus current botulinum toxin in cervical dystonia. Neurology. 2003 Apr 8. 60(7):1186-8. [Medline]. Jeuveau (prabotulinumtoxinA) [package insert]. Santa Barbara, CA: Evolus Inc. 2019 Feb. Available at [Full Text]. Diagram of the botulinum toxin injection points of the lateral canthus. (a) Diagram of the 7 sites into which botulinum toxin is injected into the glabella of men; (b) Diagram of the 5 sites into which botulinum toxin is injected into the glabella of women. Disclosure: Received consulting fee from Cerecor for consulting; Received consulting fee from L&M Healthcare for consulting; Received consulting fee from Cleveland Clinic for consulting; Received consulting fee from Heptares for consulting; Received consulting fee from Gerrson Lehrman Group for consulting; Received consulting fee from Indus for consulting; Received consulting fee from University of Houston for consulting; Received consulting fee from AbbVie for consulting; Received consulting fee from Adama. Disclosure: Received consulting fee from Teva for consulting; Received consulting fee from Schering Plough for consulting; Received consulting fee from Biotie for consulting; Received consulting fee from Novartis for consulting.